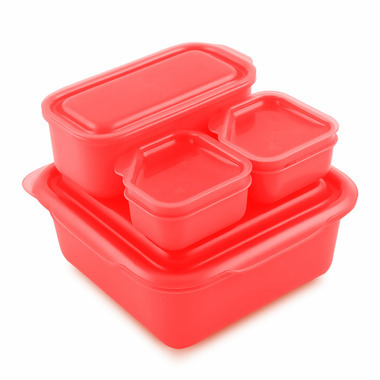 Goodbyn Portions On-the-Go is a value-priced set of food containers designed with perfect versatility. One Salad or Sandwich, one long dipper, plus two 2.6 oz dipper containers. 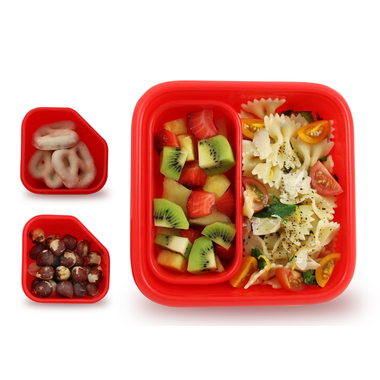 Made entirely of FDA-approved materials, no BPAs or phthalates and lead-safe, Goodbyn Portions On-the-Go is dishwasher-safe and made to last. Goodbyn Portions On-the-Go does away with wasteful plastic bags. More reasons to love your lunch! Designed for versatility. Available in five awesome colour combinations, Goodbyn Portions On-the-Go stacks, nests, and travels well.